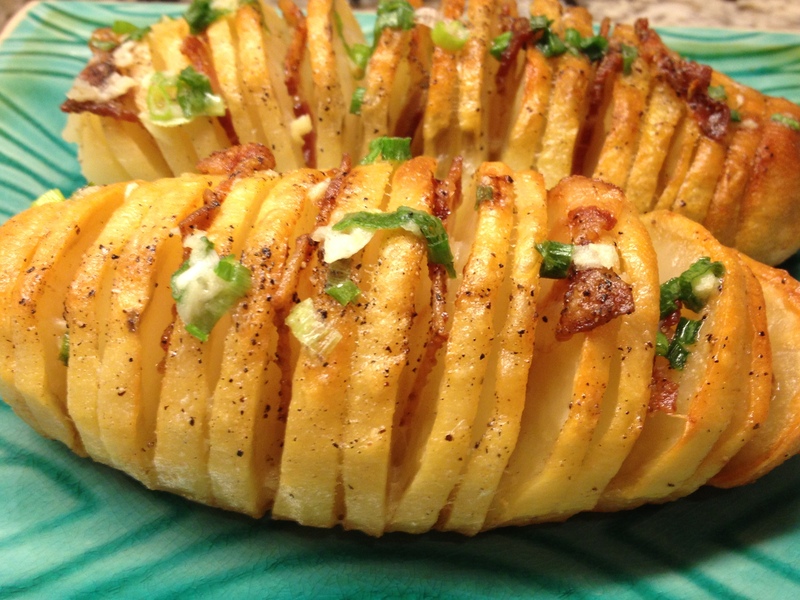 Well this recipe had me at Potatoes, bacon and garlic! 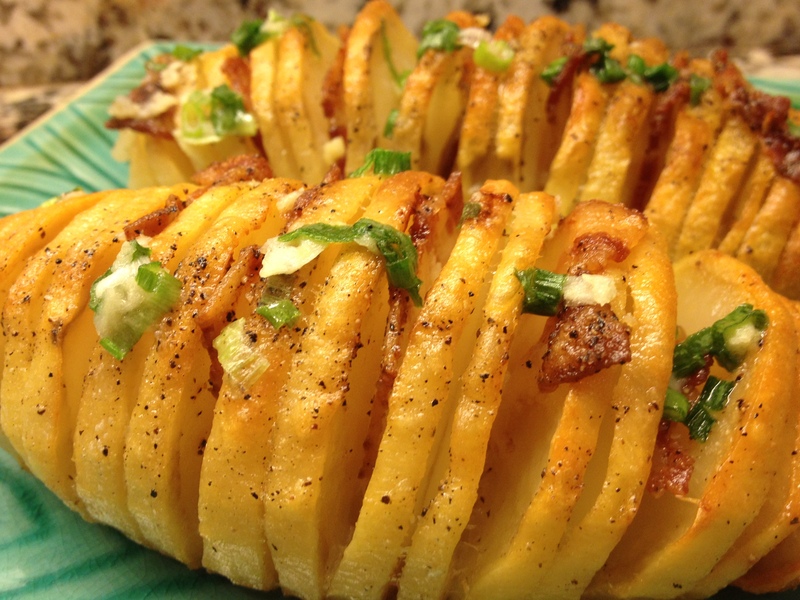 These Bacon Hasselback Potatoes were so good, everyone loved them! My husband said that they would serve something like this in a fancy restaurant. I was looking through my latest issue of the Food Network magazine, when I came across this recipe. I changed it up just slightly, I used Russet potatoes instead of Yukon Gold, and I only made 6 instead of 12. Which gave my potatoes more bacon and garlic butter topping per potato. I’m going to give you the recipe like it was written in the magazine but just know that it is versatile. Lay the bacon pieces on a baking sheet and freeze until hard, about 30 minutes. Meanwhile, preheat the oven to 350 degrees. Bring a large pot of salted water to a boil. Using a sharp knife, make crosswise cuts in each potato, about 1/8 inch apart, stopping about 1/4 inch from the bottom. Add the potatoes to the boiling water and cook 4 minutes. Remove with a slotted spoon and carefully transfer to a baking sheet (I used a round stoneware baking dish); let cool slightly. Pat the potatoes dry, then insert 3 pieces of the frozen bacon into the cuts of each potato, spacing the bacon evenly and letting it poke out of the top. Melt 5 tablespoons butter and brush generously over the potatoes and in the cuts. Reserve any excess butter for basting. Season the potatoes with salt and pepper. Transfer the potatoes to the oven and bake until the outsides are browned and crisp, about 2 hours, basting halfway through with the reserved melted butter. When the potatoes are almost done, melt the remaining 3 tablespoons butter and mix with the scallions, parsley and garlic. Spoon over the potatoes and roast 5 more minutes. Transfer to a platter and season with salt and pepper (if needed). Total time needed to make this is 3 hours so plan ahead! This recipe is a Barefoot Contessa recipe that was featured in the Food Network Magazine back in December 2011. The whole family loves shrimp cocktail but I had never seen it prepared this way. So I decided to give it a try (plus I love Ina, the Barefoot Contessa). This Roasted Shrimp Cocktail was great! 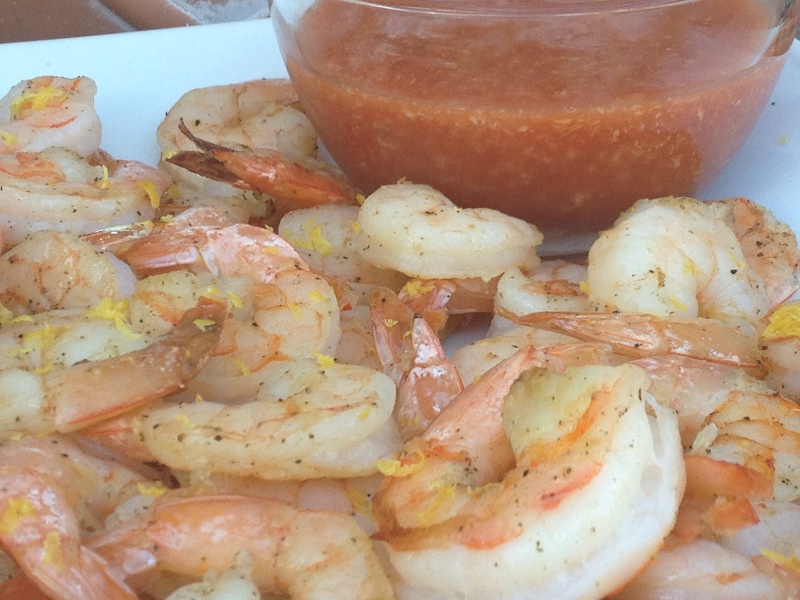 The pepper and the fresh lemon zest gave the shrimp great flavor. The homemade cocktail sauce was good and gave the shrimp a big kick (and I didn’t even use all of the horseradish and Tabasco sauce that it called for). This makes the perfect appetizer for any party or get-together! Peel and devein the shrimp, leaving the tails on. Place on a sheet pan with the olive oil, salt and pepper and spread them in one layer. Roast for 8 to 10 minutes, just until pink, firm and cooked through. Set aside to cool. For the sauce, mix the chili sauce, ketchup, horseradish, lemon juice, Worcestershire sauce and Tabasco. 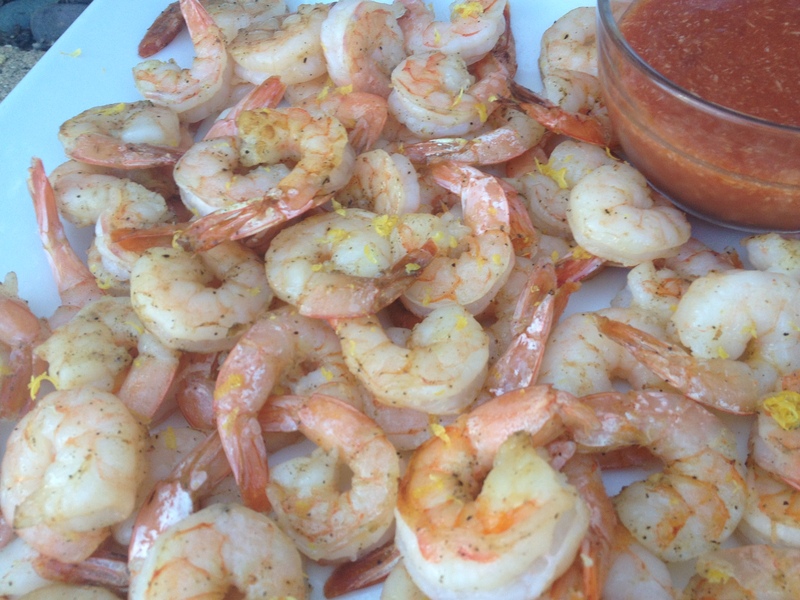 Top the shrimp with lemon zest and serve with the sauce.